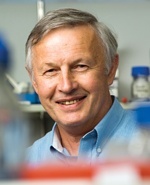 Dr Colin Ward has had an incredibly successful career as a discovery scientist. His early publications on the structural biology of haemagglutin attracted considerable attention. However, it has been his creativity, foresight, organization skills and incredible hard-work over the last 20 years which has led to the unravelling of the 3D-structures of the extracellular domains of four growth factor receptors: IGF-1R, insulinR, EGFR and erbB2. Colin not only led the teams that produced and purified these proteins, his insight into the protein chemistry and biological implications of the structures has revolutionized our understanding of the activation mechanisms for these receptors.